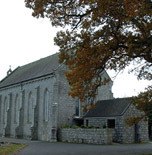 About St Mary’s Church, Bennekerry: Bennekerry was part of the parish of Tinryland until 1976. Townland names in the parish such as Ballinakill, Chapelstown and Friarstown point to early chapels in the area. An old thatched church in the townland of Bennekerry, dated 1700, was used prior to St Mary’s. The granite stone for the present building came from the quarry at Graigalug. The Blessed Sacrament was first reserved in St Mary’s c. 1930. The burial ground at the earlier church was used until 1976. Buried here is Fr John O’Neill who, in 1798, pleaded with the local rebels not to enter Carlow, where 640 men were killed. The internationally acclaimed artist, Frank O’Meara (1853 – 1888), of Dublin St., Carlow, is buried in the family tomb at Bennekerry. The nearby dolmen at Kernanstown is one of the finest in Ireland. The church was decorated in the early 1900s with four attractive stained glass windows in the 18th century style and eight other panels in a later style. 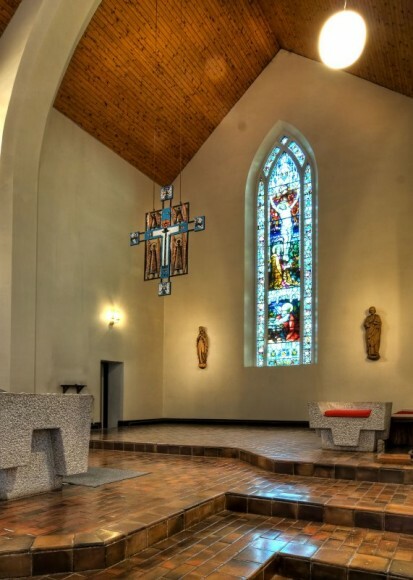 Renovations to the church took place in 1977 when Fr Gary Doyle was P.P. They included the addition of a new sacristy at the church entrance and the re-ordering of the sanctuary. J Kenneth O’Brien was the architect. Artists involved with Michael Biggs (sanctuary stonework) and Patrick McElroy (metal sanctuary furnishings). A Marian statue by Fr Henry Flanagan OP was added in 1990. Date of Church: c 1860. Style: Gothic. Building Pastor: Fr Joseph Murray P.P.